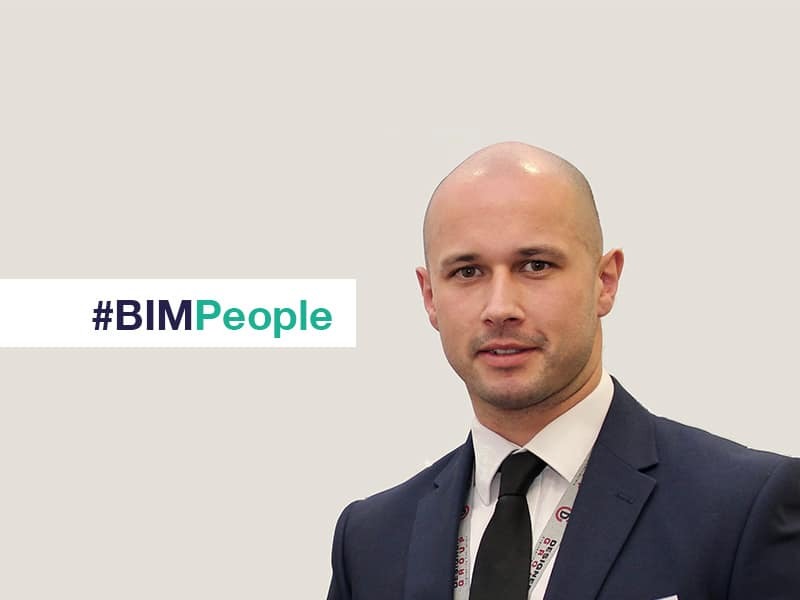 Joseph Mady speaks to BIMIreland.ie about his work at Designer Group, the company’s new Visualisation Lab, his academic work at Dublin Institute of Technology and his roles on BIM Committees. Joseph Mady is the Virtual Design & Construction (VDC) Lead at Designer Group. 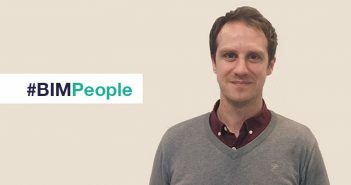 Joseph is a member of the CIF Lean Construction, Building Information Modelling (BIM), Innovation and Continuous Improvement Committee, a member of the NSAI Technical Committee on Building Information Modelling, and a member of the CitA BIM Eastern Region Steering Committee. Industry work aside, he is a part-time lecturer at Dublin Institute of Technology (DIT), lecturing on the CPD Certificate in Information Technology for Site Workers and a part-time BIM lecturer at the Society of Chartered Surveyors Ireland. Joseph has presented at CitA events, this year giving two presentations at the CitA Gathering on his research. He holds BEng Tech and BSc degrees in Electrical Engineering Services Design and an MSc in Applied Building Information Modelling and Management. Here he discusses his work. Can you tell us about your work as Virtual Design & Construction Lead? As the VDC Lead in Designer Group my duties include the management of the VDC Team which includes Task Team Managers and Information Authors within the business in addition to any 2D information that may be required across all projects. On any given day I could be in the office reviewing tenders to ensure we are covered on BIM projects or I may be onsite giving training to our site team on a range of different software packages. In addition to supporting projects we also review the latest innovative technologies and develop new technical products, services and processes, improving our digital competitiveness and creating increased value for Designer Group and our clients. Tell us about your career to date and the roles you had before this? I began my time on the tools as an electrician which gave me my first insight into the construction industry. When the Celtic Tiger deserted Ireland I moved into full-time education and completed two degrees attaining a BEng Tech in Electrical Services and a BSc in Electrical Design and Energy Management from DIT Kevin Street. Following this, I became a project manager with an FM company but continued to study part-time which opened the door into BIM. Within the digital construction environment, I have worked within the Design and Construction stages of BIM projects. This knowledge brought me back to DIT as a lecturer with the development of the CPD Certificate in Information Technology for Site Workers course and enabled me to become a member of the CIF Building Information Modelling Committee and the NSAI Technical Committee on Building Information Modelling. How has BIM changed work practices for Designer Group? When a company has utilised certain processes and procedures over a long period this brings about comfort. Comfort for the staff with the technology, procedures and processes utilised. But changing to a new process for example from CAD to BIM, the process change is often at the mercy of the resistance from the staff. Switching from the 2D mindset to the utilisation of digital technology was always going to meet resistance. At Designer Group we foresaw this and implemented a company-wide training programme to upskill the staff from each department. In addition, we ensured that we had the right software that embedded into our processes and procedures. Not changing all our processes and procedures to fit into the digital workflow. This approach ensured that the impact on our staff was minimal allowing a smoother transition. Please tell us about the projects on which Designer Group has best utilised BIM and the advantages it has brought? On a recent project, the LOC Building in Blanchardstown for Bristol-Myers Squibb, which consisted of a two-storey laboratory and administration building, we utilised digital technology successfully to complete the electrical installations. On this project alone, we had a peak of over 200 staff onsite, in which we successfully utilised BIM processes and standards. We developed, managed and coordinated the BIM model using BIM software. This project brought great buy-in from the site team who engaged with the technology. The supervisors of each floor utilised Navisworks with a model updated daily, they utilised tablets to review drawings/raise RFIs and utilised a paperless workflow to create the as-built information onsite. 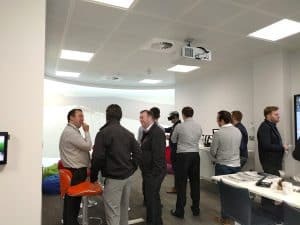 Can you please tell us about the Electronic Visualisation Lab and what the company has done to adopt BIM in recent years? On our journey to creating the first Electronic Visualisation Lab in Ireland, myself and our Director of Engineering Niall Stone visited several research and development departments throughout Ireland. One such department was the R&D department at Waterford IT who are looking at a range of different virtual and mixed realities utilising the HoloLens, Oculus Rift and a number of different hardware technologies. Following this, we picked the technology that was most applicable to our needs, provided maximum usability and was not just for show. This area now consists of a bespoke constructed wall, high-end projection system, VR station and touch-screen TV. The Electronic Visualisation Lab enables Designer Group to virtually build the building before it is built and they can present this to their clients within a greater immersed environment which enables them to experience the design. As mentioned we reviewed each department, their process and procedures. In tandem to this, we reviewed available software on the market to best embed into our system. Once we had chosen the software for our company needs we created a training plan to ensure each department received the adequate training to meet their needs. What are your experiences of working with contractors and consultants using BIM? Everyone is at different levels and have tailored their digital system to meet their project-specific deliveries. Even at this stage of the BIM growth in Ireland, we are finding our industry peers are seeing BIM as a deliverable only – a tick box exercise, something that must be delivered. When outsourcing or treating BIM only as a deliverable it tends to lead to the loss of the added value that is gained from utilising BIM on a project. In some instances, it creates additional workload as 2D information is first created by the contractor which must then be converting to 3D information. A recent McGraw-Hill report states that the return on investment is greater from companies that engage with BIM and the return on investment is seen as negative from companies that have low engagement. What is the demand for BIM like among private clients in Ireland and among your clients abroad? Clients are most definitely becoming more aware of the benefits of digital technology and recognising the benefits that BIM can offer. Designer Group always look for early engagement on projects to ensure maximum benefits are attained by all stakeholders but now clients are also requesting early contractor engagement and data-rich building information models. Clients have become more educated on BIM and really understand how the technology can add value, not only to the construction but to the full lifecycle of the building. They are attempting to bring in the correct representatives to ensure they are getting value from the BIM process on a project. A client needs to grasp BIM, such that they can clearly describe and specify what they want, education is vital and surrounding yourself with the correct team is key. Producing a clear Asset Information Requirement (AIR) document and an Employer’s Information Requirement (EIR) document would ensure a smooth transition from the Project Information Model to the Asset Information Model. How do you think Irish contractors compare with international contractors with regards their capabilities to deliver BIM projects? Irish companies are definitely at the forefront of digital technology which was demonstrated by Autodesk showcasing Irish contractors at their annual conference event in Las Vegas this year. Furthermore, with the introduction of the Government’s strategy for the increased use of digital technology in the delivery of key public works projects that are funded through the public capital programme, this will progress the Irish Construction Industry on a domestic level which they can then convey into the international market. Yes, Foreign Direct Investment has enabled Irish contractors to become best in class by remitting innovative technologies on their projects. It is imperative in every line of business, to utilise the latest technologies to retain and attract clients. Clients in some instances need to get a product to market quickly and realise that Irish contractors are capable of constructing a high-quality building within a strict timeframe. BIM enables this and allows for better programme certainty, cost certainty, logistics, health and safety onsite, collaboration, reduced waste and rework which is very attractive and aligns with the client’s needs. Tell us about your work on the CPD Certificate in Information Technology for Site Workers at DIT Bolton Street and how it is assisting site workers? How will it influence industry? BIM courses are generally tailored to the author of the information, the technician, coordinator type role. But with this course, the aim was to enable and upskill the staff on the ground. A range of proprietary software applications was selected that was considered representative of what the students needed to learn to engage optimally with IT and BIM onsite. The software packages chosen were Autodesk BIM360, Navisworks, Bluebeam Revu (pdf software), QR code printing and scanning, and the impressive inter-operable suite of applications from Google (Mail, Drive, Sites, Sheets, Google+ etc.). There are five assignments and no exam. The objective is to show the value of improving site communications and efficiencies and to provide site workers with the skills and knowledge to move to a more streamlined workflow based on wireless access to the internet and digital building information within a common data environment. How should an MEP tradesperson approach BIM education? Having come from a trade background I believe that the transition from the site to the office is a fluid and easy one to make. Having the site knowledge, the author of the 3D information has a great advantage over someone that has not come from that type of background because they know how building elements work, are to be installed and the standards relating to these from the time onsite and completing their trade. I would advise anyone with a trade background who is IT savvy and has a keen interest in digital construction to investigate further education with the large range of BIM courses currently available throughout Ireland. Tell us about your research papers and your talk at the 2017 CitA BIM Gathering? I always look forward to CitA events, the BIM Gathering 2017 was well organised, had an excellent venue and had top industry speakers. At this event, I had two presentations: ‘The Lifecycle Engineer – A new conceptual position within the evolving digital workflow’ and also ‘Information Technology for Site Workers’ – this is based on the course that is currently running at DIT. What will further increase the Irish Construction Industry’s BIM and Digital Construction capacity? The Government’s recent release stating for Building Information Modelling to be required in the design, construction and operation of public buildings and infrastructure over the next 4 years will be a major factor in driving the industry forward. 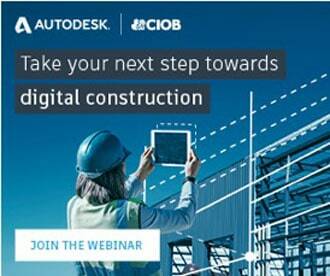 At present, a lot of work is occurring to further develop the industry’s knowledge on digital construction. If we look at the amazing work that CitA have conducted, the BIM regions recently launched the new website which I am part of with the Eastern Region – these are two good examples of the work being done. The Construction Industry Federation have a technical committee who are also trying to raise the awareness of digital technologies for all contractors. There definitely will be challenges ahead for the Irish Construction Industry but the outlook is positive.